Share the post "How to Set Achievable Goals For Your Social Media Campaign"
In order to achieve anything in life, you need to have a clear picture in your mind of what you want to achieve. This is the case in every aspect of your life – and with social media. Beyond picturing the end result in your mind, you need to write your goal down, so it is more tangible. In social media, goals are very important as well. Once you decide what you want to achieve with your social media marketing efforts, you can start thinking about a strategy. But how do you make sure your goals can really be achieved? I am sure you all heard already about SMART goals. SMART stands for specific, measurable, attainable,relevant and timely. 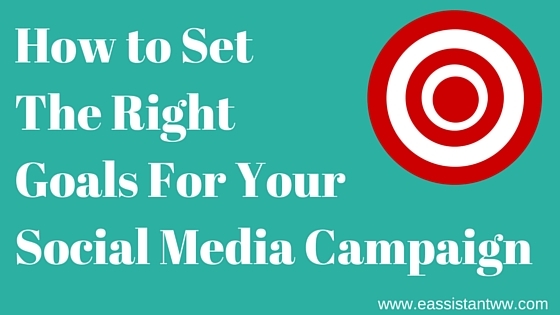 As so many other goals in your life, your social media marketing goals need to be SMART. What exactly do I want to accomplish with social media marketing? Do you want to gain more Facebook Fans, more Twitter followers, more LinkedIn connections, have more traffic on your website, sell more products or have more people sign up for your list? Why do you want to accomplish that specific goal? It is great to have more followers, fans and connections, but what benefit will that give me? Is it that I can use the number as social proof? Who is involved? Usually it will be you and your target audience. Which requirements and constraints need to be watched? For example, Facebook only allows 5000 friends on your personal profile. In order for your goal to be measurable, you need to have a specific amount in it. You need to answer the question: how much of it? Did ever anybody achieve a goal like that before? Is it do-able? > As for our examples: yes, both are doable and a lot of people have achieved those goals already. How important is it to achieve that goal? Will it be worth to spend time and/or money in it? > Both goals in our example are worth your while. Having 200 more subscribers in your list means you have a bigger pool of potential clients that hear on a consistent basis from you. Having 200 more Facebook fans can signal to your potential client that you are worth checking out. When will you check if you achieved your goal? In 60 days? In 90 days? You need to have a specific due date so you can check if you reached your goal or if you need to make adjustments. Think about your social media marketing goals. Brainstorm freely. Just make sure your goals are SMART.